Embroidery is a fun and creative way to pass the time, but if you're just beginning it can look a little daunting. Here are some tricks to get you started. Embroidery is an ancient art form. Archaeologists found the remains of a Cro-Magnon from around 30,000 BC whose clothes were decorated with embroidery. It continues to be a popular handicraft today. 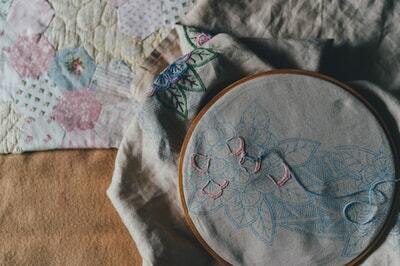 Read on for 5 best tips for embroidery beginners. Common mistake embroidery beginners make is choosing the wrong fabric for their project. As with most things in life, you get what you pay for. Cheap fabric won't last long, and won't highlight your effort and delicate stitches. Plus, it is harder to work with during the process. You need to think about the support you need in your fabric. This depends on the type of embroidery you'll be doing. Heavy stitches will need strong fabric with a good weave to hold the stitches in place. Also, pay attention to the grain of the fabric. Mount your fabric on the grain for best results. Otherwise, you'll be dealing with warped and puckered fabric. The next thing you need to decide is whether you will use a hoop or not. Some people prefer not to. But, in most cases, your final product will be tidier if you use a hoop. This is the easiest way to keep your stitch tension just right. Not all hoops are created equal, though! It's best to buy a high-quality wood hoop that has brass hardware. Look for a hoop that has the inner ring bound. There are dozens and dozens of embroidery stitches. But it can be overwhelming to try to learn them all. One of the best no-fail tips for embroidery beginners is to learn the basic 10 stitches. Then, you'll be able to use embroidery to add personal touches to your home. There are many video tutorials you can watch to learn how to do each stitch. For now, we'll just list the 10 stitches that you'll need to know. Back Stitch. This embroidery stitch is easy to learn. It's vital to many other stitches. Buttonhole Stitch. Buttonhole stitches are used in many types of embroidery. For example, it is used in decorated edges as well as fillings. Chain Stitch. The chain stitch is the foundation for many other stitches. Master it early and new stitches will come more easily. Detached Chain Stitch. This stitch is perfect for creating leaves and petals. French Knot. Use this stitch when you need small textured dots or knots. Long & Short Stitch. This stitch may seem complicated, but it's simple to learn. You will use it for filling in spaces with a solid colour. Running Stitch. The running stitch is a good first stitch to learn. It's basic and comes in handy in many embroidery techniques. Satin Stitch. All embroidery beginners must learn this stitch. It's the best for solid filling. You'll be glad you learned this one. Split Stitch. This stitch can take a bit of time to get the hang of. But it's worth the effort. You'll use this stitch in many ways. Stem Stitch. This is a popular stitch because it's so adaptable. You can use it to craft fine and heavy lines. And it looks beautiful. One of your early embroidery projects could be to practice each stitch over and over. You may not want to hang up your completed patchwork. But learning these stitches is fundamental to embroidery. If you use an embroidery kit, you won't need to worry about transferring a design. But kits are limited. You will for sure have to transfer a design at some point. There are many ways that you can transfer a design to your fabric. This is important if you ever want to create your own design here. A simple, no-cost way of transferring your embroidery design is to trace it. All you need is a window or lightbox. Tape your fabric over the light source. Then, use a pencil to trace the design. Use smooth flowing lines to make it easier. You can buy dressmaker's carbon at any fabric store. It's actually not carbon but a type of transfer paper. Lay your fabric on a hard surface and tape it in place. Then tape the carbon over the fabric. Make sure to line up your design where you want it to appear. Then, use a pen to trace the lines of your design. Use a firm stroke. When you lift off the carbon paper, your design will be showing on your fabric. There is also other types of transfer paper that you could use to achieve the same result. Make sure to read the instructions carefully, first. Another simple option to transfer an embroidery design to your fabric is to use an iron-on transfer. Usually, you print the design onto the transfer paper. Then you use a warm iron to transfer the design to your fabric. There are other methods of transferring your design. But these three methods are the most simple ways with the lowest cost. The final tip for embroidery beginners is to learn how to separate your floss. Many people do this wrong. They'll end up spending a long time untangling threads or will create knots in their floss. First, cut the length of thread you’re going to use from the skein. Then grip the thread half an inch from the top. Grab one strand from the set and gently pull. Do this while keeping your firm grip on the bunch. Continue, one thread at a time, until you have the right number of threads for your project. There you have it. 5 important tips about embroidery for beginners. Embroidery is an enjoyable and beautiful handicraft that can be used to decorate your home or make unique gifts. Want more crafting ideas? Check out these ways you can craft with a gold leaf.